lt;stronggt;CRD16703lt;/stronggt;lt;BR/gt;Cardinal SpineVue Locking Round Ring Binderlt;BR/gt;Exclusive wraparound clear overlay holds standard letter size sheet. 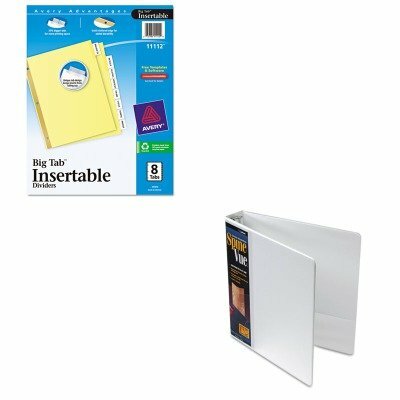 Easy-to-customize for presentations or filing-no trimming or fumbling with small spine inserts and separate cover inserts as needed for standard view binders. Leather-like vinyl cover material and hidden rivets for a professional, premium look. SureLock lockable round rings stay aligned and won't accidentally open or spill contents earning this binder the amp;quot;Ease-Of-Useamp;quot; Commendation from the Arthritis Foundation. XtraLife Hinge design for maximum strength and durability. Two inside pockets for additional storage. Capacity Range Max: 1 1/2amp;quot; Sheet Capacity: 375 Colors: White.lt;BR/gt;lt;BR/gt;lt;stronggt;AVE11112lt;/stronggt;lt;BR/gt;Cardinal SpineVue Locking Round Ring Binderlt;BR/gt;50% more printing space for tab titles than traditional tab dividers. Special tab design allows easy insertion and removal, but keeps insert securely in place. Three-hole punched for use in standard ring binders. Laser and inkjet printer compatible. Tab Style: 8-Tab Tab Colors: Clear Index Divider Size: 11 x 8 1/2 Form Quantity: 1.